San Francisco’s Castro District is poised to become more vibrant by the end of the year after the neighborhood benefit district supported plans for an improvement project that includes colorful crosswalks, sidewalk etchings and multi-colored street lighting. The Castro/Upper Market Community Benefit District board approved spending $103,000 at its Feb. 13 meeting to add design features to the city’s Castro Street Improvement Project. The Castro Street Project, a multi-agency $7-million project is a collaboration with the city’s Planning Department, Department of Public Works, Municipal Transportation Agency and others. The project includes widening the Castro Street sidewalks between 17th and 19th streets and adding a sidewalk bulb-out along with improvements to Jane Warner Plaza at the intersection of Market, Castro and 17th streets, and putting up new trees and lighting. That project is scheduled to start by the end of this month and wrap up by early October. Andrea Aiello, executive director of Castro/Upper Market Community Benefit District, said an outreach campaign through the Planning Department last year found that residents were strongly in favor of additional “beautification” elements that the city was not able to include in the project. The benefit district stepped in with its reserves and is now looking into designs for four special decorative crosswalks, 20 etchings in the sidewalk with historical facts about the neighborhood and 24 light poles lit up by colorful LED bulbs. 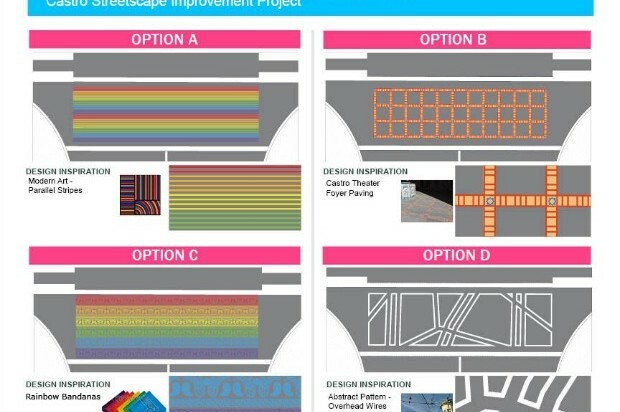 For the crosswalks, there are four different designs, two of which are rainbow-themed and two others that include a pattern inspired by the Castro Theatre foyer pavement. 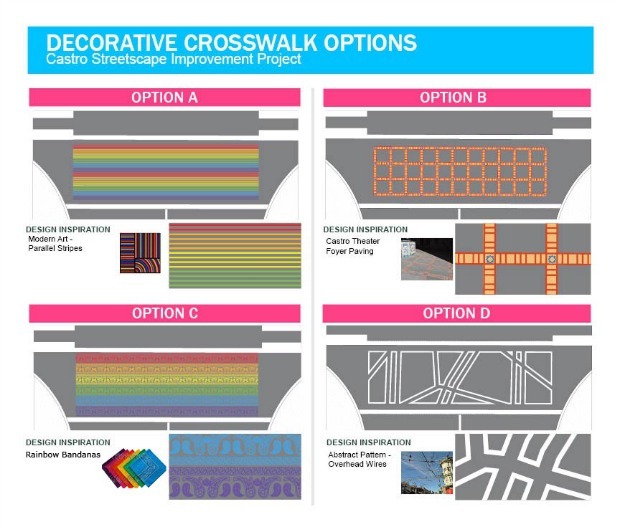 The community is also being asked where they would like to see the decorated crosswalks: either at all four crossings at Castro and 18th streets or two at Castro and 18th streets and the other two at Castro and 19th streets. On Sunday, the benefit district and officials from city agencies involved in the project will be asking the public for input on designs and locations. The survey will be conducted at Jane Warner Plaza between 1 p.m. and 4 p.m. Votes on designs and layouts can also be made online at https://www.surveymonkey.com/s/CastroCrosswalkSurvey. The survey closes on March 5 and the results will be released on March 10, according to Aiello. Aiello said the benefit district expects the new street decorations to be installed by October.